At the centre is the fractured mind of Christopher Baldry, a Captain returning from the Western Front. Hospitalised after suffering a head injury in a shell strike which killed his comrades, he's sent back home to convalesce. On his return his family are delighted that he's in one piece and apparently in good spirits. But while his body is intact his mind isn't. More specifically he's completely forgotten Jenny, his wife of many years and is fixated on Margaret, a past girlfriend and his first love. She was a simple country barmaid when Christopher swept her off her feet and the two embarked on a passionate summertime romance, to be eventually separated by class divisions. But now, with the dormant fires of love stoked to life, he falls madly back in love with her. He's happy. Margaret is happy. Christopher's wife Jenny less so. Ditto Margaret's husband William. And so we begin unpicking his mental trauma, the material gradually transitioning into a debate between the relative merits of miserable reality and happy delusion, with the wrinkle that if Christopher regains his 'sanity' he'll be summarily tossed back into the meatgrinder of the Western Front. The key to appreciating The Return of the Soldier is to keep it's date of publication firmly in mind. The novel was written during the war, so isn't bound up in traditional historical narratives of what the Great War signifies. One notable difference is that this is a story from a feminine perspective; shorn of the traditional iconography of trench warfare, mustard gas and poppies - ratherinformed by the worries, paranoia and fear of what misery is taking place a hundred or so miles over the channel. That the material is very much of its time has its downsides too. Freudian psychotherapy was very much en vogue, and West's book treats mental illness and trauma as if the brain is a piece of faulty plumbing with blockages that need to be cleared. The central plot device of amnesia is painfully cliché in 2014, and the eventual treatments quaintly straightforward to modern audiences. Regardless of the source material's qualities, it at least works well as a musical. This is a fat-free staging, with a cast of just five, a sparsely decorated stage and keyboard led score,. By necessity this means events are tightly locked onto personal drama rather than straying into the epic. Even within the small cast, emotional focus is zeroed in on the two women battling for Christopher's love; both of whom are at minimum three-dimensional characters with their own fears, hopes and passions. The production is no slouch in musical terms either. The refrain of the title echoes throughout the songbook, varying into from triumph to sadness. The musical progression dovetails nicely with our evolving understanding of the meaning of 'the return of the soldier', whether it be the physical return of Christopher at the beginning of play or the psychiatric resurrection of a soldiering mentality. 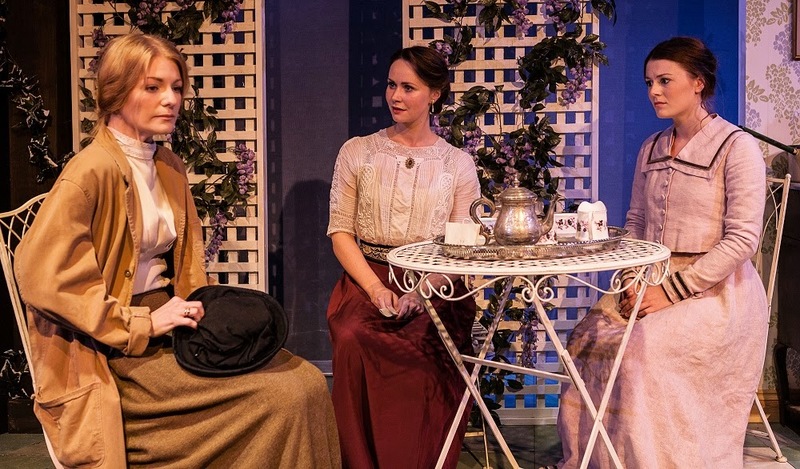 Furthering this musical thematic development is the frequent close-harmonising of the three women , nudging the audience towards recognising the erosion of class boundaries caused by the war. As far as individual performances, the obvious stand-out is Michael Matus' 'end of the pier' song about the joys of psychiatry; of putting men's minds back together and bundling them back off to war. 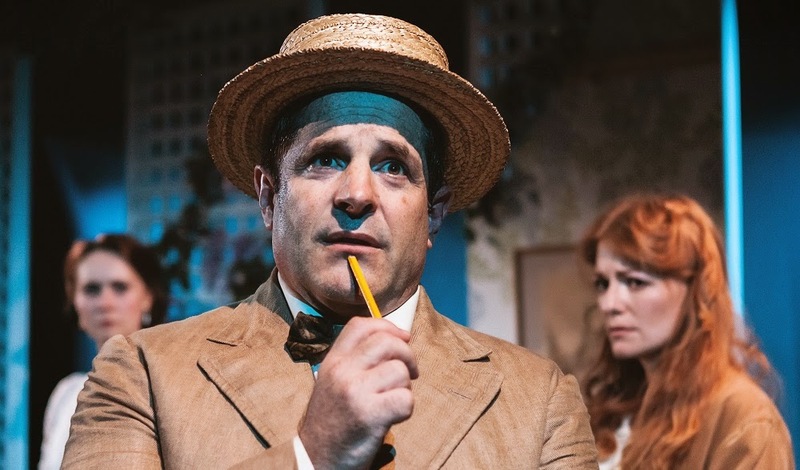 Cane in hand and straw boater on head he cuts a sinister sight as he stalks across the stage, delivering an upbeat, jaunty number. Though leavened with ominous undertones it's a moment of levity and energy - just the ticket in a musical largely about heartache. There's a lot to like in The Return of the Soldier and by the time the curtain fell I was surprised how much my opinion of the show had improved. Obvious care has gone into translating West's novel into a musical form, the fruits of that labour clear to see. Most of the flaws lie largely with the dated structure of the novel, though that it's very much a product of its time is a boon as well as a curse. In a centenary year replete with puffed-up politicians and mawkish displays of sentimentality it's refreshing to see a production that refuses to make grand pronouncements on the morality of the Great War. In this regard it's largely a success. Though dated, a touch cheesy and a bit melodramatic, this is a fascinating time capsule of 1918 sensibilities. 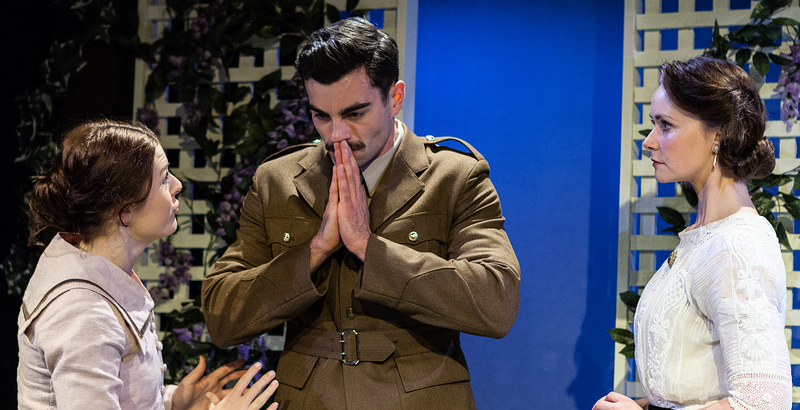 The Return of the Soldier is at the Jermyn Street Theatre until 20 September 2014. Tickets £16 on sale here.